A storm system is heading north from the U.S., expected to hit parts of Ontario, Quebec and the Maritimes later this week. Environment Canada issued several weather statements on Monday morning, warning that a "major storm system" is expected to hit southern Ontario Wednesday. The storm is expected to continue east, passing through southern Quebec and New Brunswick late Wednesday night or Thursday morning. The weather agency said the storm will be caused by a low pressure system developing over the southern U.S., which is expected to head north. "This storm is expected to bring rain and significant snow to some areas, along with the possibility of freezing rain," the statements for southern Ontario said. In Quebec, snowfall is expected to arrive first, but will transition into freezing rain and then rain by Thursday. 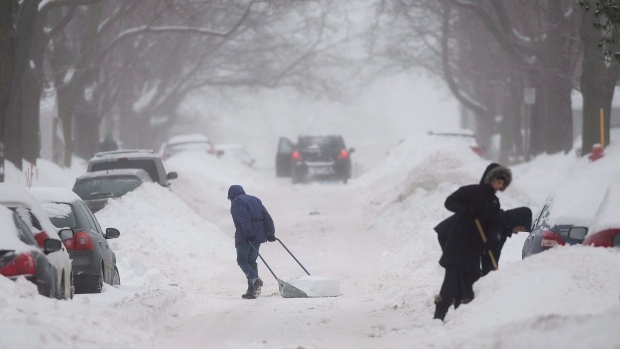 In New Brunswick, the weather agency forecasts snow changing to rain on Wednesday evening. The rain is expected to last through the day on Thursday, and may be heavy in the southwest. Snowfall, freezing rain or rainfall warnings may be issued if necessary. The statement said it is too early to predict the exact path of the storm, so it is not yet known which parts of the provinces will be hit with the heaviest snowfall, or how much precipitation residents can expect. Environment Canada said the statements will be updated "as the storm system evolves."